This is the demonstration drawing I did during my most recent "6 Sundays" figure drawing class with 6 private students at my studio. The "moon" in the upper right corner is the remnants of my lecture on how light and shadow behave on a sphere. We all had a wonderful time studying the figure in a long, multi-week pose under cool north light. 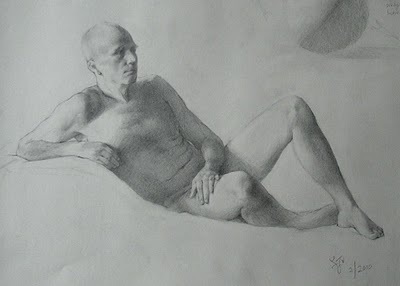 I am offering my next Classical Long Pose Figure Drawing class at my studio in San Francisco beginning May 16th, 2010. Please visit my Classes and Workshops page for more information. I am also planning to set up a long pose model share, full time for 2 weeks, probably in July. If you would be interested please email me to let me know: sadiej@gmail.com. This will be an uninstructed workshop, limited to a small group, with the option to draw or paint. More information coming soon! Also, I leave tomorrow to fly to Florida for my opening at M Gallery in Sarasota, where I will be showing 6 paintings. beautiful work Sadie and congratulations on your exhibition! March 4, 2010 | rahina q.h. Beautiful drawing and I've been meaning to tell you, your work looks great in American Art Collector-good luck and have fun in Sarasota! Sadie, Nice energy in the diagonal of the pose, and great cast shadows. That moon even looks good! Best. I got to your blog through a couple of links and am glad I followed them, as I'm enjoying seeing your work and process.